My research into early 1920s Home Mission Stations has seen me dipping into the Harvest Field, the Presbyterian Women’s Missionary Union (PWMU) magazine. First published in 1906, its aim to motivate and inform women on how to achieve their missionary goals has resulted in a goldmine of information, often not found elsewhere. 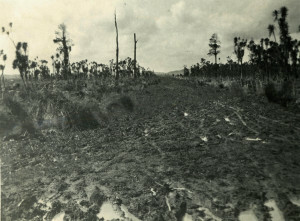 During World War I the PWMU were encouraged to support Home Missionaries alongside their overseas mission activity. A monthly article began to appear in the Harvest Field, which gave a vivid insight into their ministries successes and many trials. Admittedly, the aim of the publicity was to garner the sympathies of the readers, but there is little doubt that the expectations of a back-block ministry quite often bordered on the unreasonable. Although written just under 100 years ago, the Home Missions Director, Rev. George Budd’s reports have a familiar ring to those tales my parents told of the mid-1940s and early 1950s; little, it seems, had altered in 30 years. Financing a back-block church where a scattered population came together infrequently, from a wide area, had always been difficult. The Committee had to plead, if not bully, larger congregations into giving financial support through special collections, donations and even bequests, and cajole an already pressured PWMU to donate goods and their time. 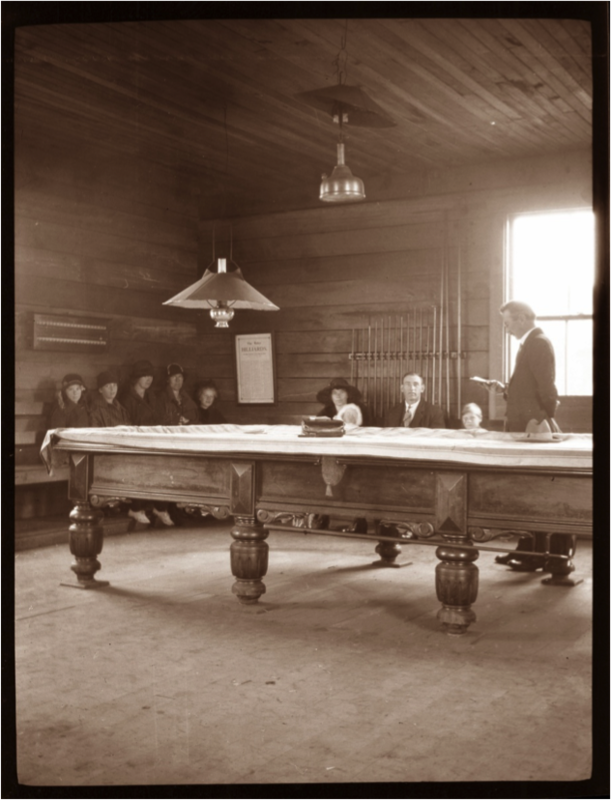 By the 1920s, 117 Home Mission Stations had been established, staffed by 87 men; 85% of the Stations were beyond the bounds of small towns. Budd, early in his term as Director, recognised the role women could take in the Home Mission field and the Committee employed several over the years. Service conducted around a pool table. Location unknown. The physical strain of travelling from one preaching place to another on any one Sunday, the infrequency of worship in the more isolated centres, low attendance and the places used for worship also provoked his critique. A school classroom, a poorly built and draughty hall or a back room of a hotel did not come up to Budd’s expectations as ideal places of worship. ‘The pleasant environment of a church, the impressive music of a majestic organ, the rich choral work of a choir – all was missing’. Mind you, this somewhat embellished vision of a place of worship did not fit many worship centres, other than a few in large towns and cities. 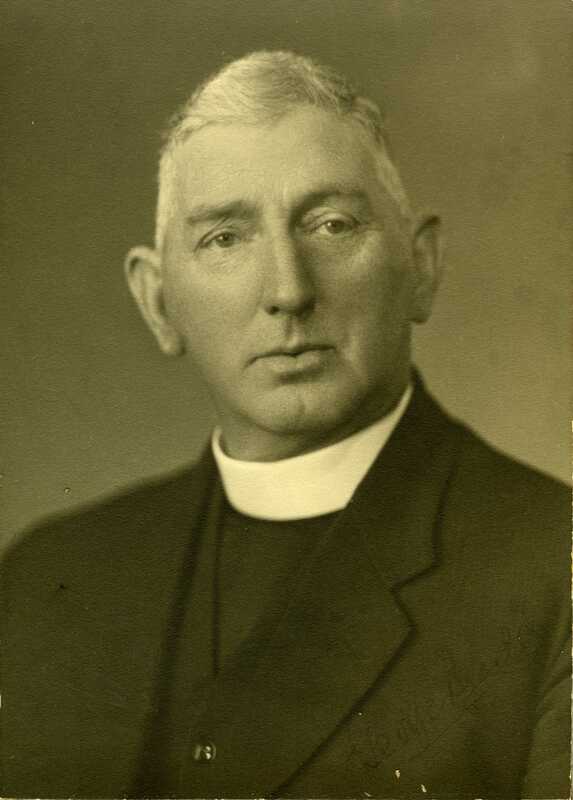 Budd may well have been missing his home parish of Devonport, as he was away on Home Mission duties for weeks at a time. The ‘manse’ in the back-blocks were often humble dwellings in comparison to a fully sanctioned parish where simple guidelines applied. Single men described the one or two room shacks as barely suitable, and family accommodation was generally inadequate. There was a lack of modern-day conveniences of the time. Molly Shannon tells of their weekly bathing in the stream below the manse. Laundry facilities in a number of ‘manses’ were outside under a small lean-too proving to be very inconvenient for the women who undertook the heavy task of using a copper and mangle. One wife described the kitchen range as puffing out more smoke than heat and badly designed kitchens resulted ‘in walking miles’ in a day just to prepare food, stated another. Electric light and the telephone had reached few of the remote areas by 1920 and where it had the manse generally was the last to be wired up. The burden of these many discomforts fell heavily on the women and children. Coupled with the many inadequacies of housing was the low stipend payment. ‘It has often been a struggle with poverty’, stated one Home Missionary. He added that without ‘the charity and generosity of our PWMUs’, many Home Missionaries would not have managed thus far. Another noted he had been in the service for 17 years on a stipend of $200 to $220pa. Yet another expressed what many also considered, ‘time and again I have thought of resigning’. On an average, the stipend was $300pa lower than ordained ministry but it carried the same expectations. Home Missionaries were excluded from the Beneficiary Fund and many had used their savings to make ends meet. The sacrifice was great. What’s more, the Church’s policy to transfer Home Missionaries every two or three years added further pressure and expense that few could sustain. A questionnaire on stipends Budd circulated ‘resulted in depressing reading’, but even this did not stir the church fathers. A liveable remuneration did not justify the extra pressure on congregations, they opined. Although the General Assembly debated Home Mission stipends regularly, and did offer occasional relief, some extra theological training programmes, or ordain those with some qualifications, the stipend remained well below the standard stipend. This was partly due to what was perceived as the ‘unqualified nature’ of their status. Budd supported the respondents comments, reinforcing their ‘rights, which they had earned by steadfast service’ and agreed that the church ‘cannot ask such men to be simply nothings and nobodies’. It’s worth noting that the majority of Home Missionaries were unable to speak or vote at General Assembly and therefore, relied on sympathetic supporters to present their ‘case’. For all Budd’s efforts, publicity and his visits to congregations, funding for both Maori and Home Missions was a constant exercise of persuasion. Budd reminded his readers they were ‘doers of the Word, not just listeners, and therefore not to deceive themselves’. People who took no action he compared to ‘aspen leaves, tremulous, sensitive, quivering, which sway with agitated responsiveness with every breath of wind, but though they are moving all day long, the night finds them just where they were in the morning’. Through his 17 years as Director, Budd stood by the Home Mission team doing what he could to improve their lot. Unfortunately, for researchers and Presbyterian Archives staff today, Budd decreed on his retirement that the ‘old stuff ‘ he and others accumulated would be destroyed. We are fortunate his reports have survived along with some personal correspondence found in ministers collections. There have been arguments for and against the success or otherwise of the Home Mission scheme. The strategy to employ theologically untrained missionaries led to a two-tier ministry within the Presbyterian Church that existed into the 1960s. Even though ministry in the back-blocks was challenging and often difficult and lonely, a large majority gave dedicated service, without which the Church’s goal to meet the spiritual needs of many in outlying communities may never have been carried out.